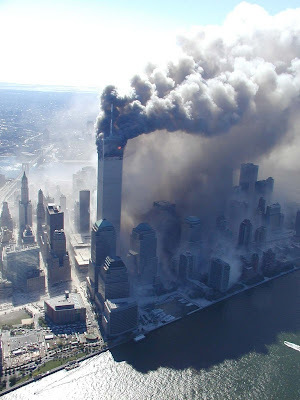 Note from the Undicisettembre editors: The following text was written on 12 September 2001 by a survivor of the World Trade Center attack who was in the North Tower when Flight AA11 hit the building. He has requested to be named only as Bruce. The text is published with his permission. Photographs are taken from Undicisettembre's image database. 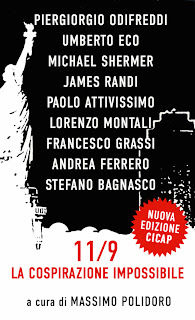 An Italian translation is available here. I had no idea what was going on, I only knew I had to get out of the building. I was on the 71st floor of World Trade 1. I ran for the closest staircase. I saw a co-worker at the end of the hall when I got there, he had a questioned look on his face but I could not speak, I just kept running. Fortunately he made it out okay, otherwise I would not have been able to forgive myself for not telling him what I saw. I flew down 20 or 30 floors before the stairwell backed up with people trying to get out. The people were great; everyone was courteous and helpful towards others. Everyone moved over when the firefighters needed to get up, and when the wounded needed to get down. When I got to the 5th floor I felt a wind in my face, I thought great I'm almost out. Then the wind was so strong it was pushing me up the stairs. The stair well filled with smoke, the lights went out, and the build began to shake. This was the first moment when panic set in. I did not know if I would pass out from the smoke or be able to find my way out. We started going up, as people from below said we cannot get out this way. We exited the stairwell at the first floor we came to that had reentry. The lights were still out; there was a foot of water on the floor. We went to the end of the hall to find another stairway, only to find hotwires dangling and sparking from the ceiling. We went back and up one more flight of steps. Here we found firefighters that guided us to another stairwell. We went down with a river of water flowing at our feet and finally came to an end of the steps; I walked out into a room that seemed completely foreign to me. I asked a firefighter, where am I. He told me just keep moving. It took me a few moments to realize I was in the lobby I had gone through everyday many times. It was filled with smoke, dust, and debris. We were guided to an exit, once outside you could not tell you were out. It looked just as it did inside. The streets were deserted, covered in a foot of soot and debris. I looked up to get my first look at what had happened. 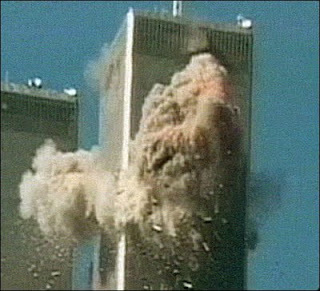 I was stunned when I saw only one of the Twin Towers. The air was unbreathable where I was, so I started to go north. I went about 10 blocks before I came to a place were I could breathe again. I stopped to clear my eyes and lungs to experience another rumbling, like an earthquake. I turned and looked up at the building I had just escaped from it to see it crumble and fall. These 2 buildings that have been a part of my life for more than 30 years were gone. I could not believe, I still cannot believe what has happened. My world has changed forever. It can never be the same. It can never be fixed. I found a phone to call my family, to let them know I got out. And I started to walk; I walked for more than 8 miles until I came to the home of my parents on the Upper East Side. I went to their apartment where they were waiting for me and I collapsed, physically and mentally. I wanted to keep going, to go to Long Island to my wife and children, but I could not move, I had to stay the night. It took me an hour and a half to get out of the building. 10 minutes to get to a safe spot before the building came down. I realized how lucky I was. I knew many thousands were not as lucky as I was. I was sure many of my co-workers had to die, but I was very happy to find out I was wrong about that. I was the last of my team to report into the home office in Denver; my group had made it out. I continue to think about those firefighters that were going up, when I was going down. There is no way they came out. I thank God that I got out.